Prima Evadare is a cross-country race for both professional and amateur cyclists, organized by NoMad Multisport Club from Bucharest, Romania. It is the biggest race from Eastern Europe gathering participants from over 30 countries. The competition has one track: 55 km. The race is point to point from Bucharest to Snagov and will be held on public roads, forest roads, paths, and fields from Ilfov county in the north of Bucharest. The race will run under the UCI regulations. This Technical Guide covers the procedures for the race scheduled for Sunday, May 19, 2019. The purpose of the event is to develop Romanian Mountain Bike community and be a starting point for changing Romanian people’s lifestyle. Category of event: The event is Cross Country Point to Point format (XCP) for Elite Men, Elite Women, and Amateur cyclists. Venue: The event will start in Baneasa, near Bucharest (GPS data: 44.517603, 26.083117) and finishes at Snagov, Ilfov County within Astoria Complex (GPS data: 44.722600, 26.190666). Start place is located at 7 kilometers from Bucharest and 6,8km from Henri Coandă International Airport. Finish place is located 43.7 km from Bucharest. Categories of riders: Any holder of a valid international license UCI category ELITE MEN / WOMEN and Amateur cyclists (Age categories: Men 15-19, 20-29, 30-39, 40-49, over 50 and women – open), special categories: cyclocross, tandem, family teams, couple teams, company teams (minimum 4 men and 1 women). Bank Transfer: RO02UGBI0000132014804RON, CIF 29441005, Clubul Sportiv NoMad Multisport. Distribution of race numbers starts according to the event schedule. Elite Men/Women must hold and present a valid 2016 UCI license issued by a National Federation. Racing may not be permitted to riders not showing their racing license at registration. The participants registered online will sign a statement of liability before taking the start package. From April 15 on the entire course will be marked with spray paint. On Saturday, May 19th the entire course will be marked with the official signage. 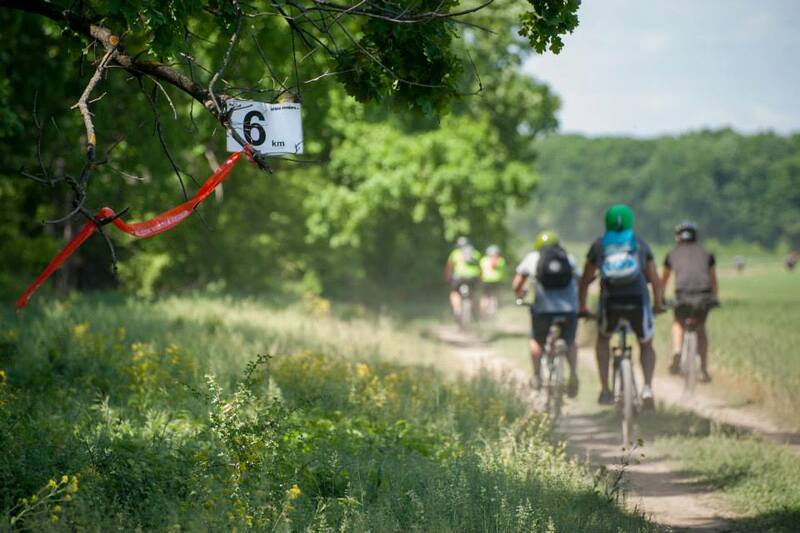 The distance of the race covers 55km of the off-road track which crosses forests, meadows, green fields, historical places and lakes arriving at Snagov, at the leisure resort Astoria. It also crosses national roads which are guarded by police and race officials. This type of competition is also called point to point, due to the fact that Start and Finish areas are in different places. The whole distance is marked with arrows and bands and is supervised by the officials. There are 13 checkpoints assigned, a Start and Finish area, 3 feeding areas, 7 Police crews, 2 helicopter, 3 emergency crews, 20 official photographers and a filming team. Feeding areas are CP 6, CP 8 and Finish. The provisions can be given only in the specified zones. Support staff will be allowed to aid their athletes with foodstuff and water or similar. The Organization will demarcate the Feed Zones 50 meters before and 50 meters. All three zones will be numbered and will have START ASSISTANCE and FINISH ASSISTANCE signs. The race will be covered by rescue teams with ambulances stationed around the race (Start, CP3, CP6, and Finish) and with direct access to the hospital. First Aid: The Organization will provide first aid at the venue during competition. Participants will be responsible for any further treatment and resulting costs after the event. Closest Hospitals are Elias University Clinical Hospital, Bulevardul Mărăști 17 (6,4km) and Floreasca Clinical Emergency Hospital, Calea Floreasca 8, Bucharest (9km). There will also be 3 timing hot spots (intermediates). The course will be clearly marked with signage according to UCI standards along the course. These directional arrows will indicate the path to follow. These arrows will be located to the right of the course; from 10 to 20 meters before a crossroad a red/white band must be marked, and 10 meters after the same crossroad another orange CST band will be marked to confirm that the participants are on course. The letter X will show an incorrect direction. Every 10K a sign will indicate the remaining distance to the finish. The award ceremony will take place according to event schedule at Astoria Snagov Complex. Riders must attend the awards ceremonies and be present on the podium wearing their rider uniform. Failure to do so will result in a fine and loss of award (including prize money). Riders who cannot attend the awards ceremony must advise the President of the Commissaries’’ Panel and the organizer with a valid reason. Prize list: Financial and and material prize. Specified above in Prize list section. Time measurements will be taken by using electronic chips at the start, with 3 intermediate points, and at the finish line. There are transport arrangements for participants and their bikes for departure. Departure will take place according to the event schedule. The organizer is not liable for any personal injuries or damage to any property incurred by participants in connection with the race. The organizer reserves the right to change the route in the event of unforeseen circumstances. If the race could not take place due to God’s will, or any other reasons, which has not arisen due to the organizer’s fault (such as natural disaster or epidemic), the entry fee will not be refunded. The personal data given by participants upon registration will be saved and processed for the sole purpose of implementing and running the event. Upon registering, the participant agrees for their data to be saved. The Participant hereby consents to the personal data they have provided being passed on to third parties in order to record times, draw up and disclose lists of results and publish them on the home page. Upon registration, the participant consents to the event organizer distributing their data via all suitable media (the home page, written and online publications). The participant hereby agrees that the personal data they receive upon the participant’s registration may be saved and the photos and video material is taken at the Prima Evadare may be used and published free of charge.